The house on Timber Lane wasn’t, at first, our full time house. It was a relatively rustic retreat we absconded to during summer vacations and winter weekends. Here, the air was a bit crisper, the stars brighter, the mountain views spectacular enough to both calm and inspire. Summer meant warm afternoons at the cool river, hikes over tall mountains, forays into the woods to build forts. Winters were filled with creating giant snow structures, exploring on skis, wood smoke curling from the chimney, and the laughter of friends to warm us. When my parents retired to the peace of the mountains, the house on Timber Lane became the family home. With my brothers and I grown and thousands of miles away, when we came “home” it was to Timber Lane. Last summer, with my younger brother and I living within a few miles of my folks and my older brother entering his second decade on the opposite side of this wide country, my folks downsized. They left the house on Timber Lane – some two miles from where my family and I live – and moved just around the corner from us. We didn’t grow up on Timber Lane, technically speaking, my brothers and I. It wasn’t where we waited for the school bus each weekday morning and concentrated over homework in the evenings. But this was the house my father built, using boards milled from two pasture pines that once stood on the property. It was in this house that we waited impatiently to come down the rough-finished stairs on the Christmas mornings of our childhood, jostling each other for a position that might allow a peek at what Santa had left. It was here that we arose winter mornings in the frigid predawn to head off to ski races, sometimes catching the first soft glow of sunlight pushing up from behind the tall mountains in the east. Here we built campfires for roasting marshmallows and lighting sparklers on the Fourth of July, crafted tiny dams from sand and clay in the stream along the driveway, picked blackberries heavy with sunshine from brambles along the road. It was here, when I was abroad a decade ago and wandering beyond my mother’s comfort level, that I decided to return – not to the lofty mountains of Colorado or the mesmerizing sea and lilting voices of Ireland, although I hold those places dear. But to a tiny town in northern New England, to a house filled with light and memories. And so in some ways, my parents leaving that house was a bit melancholic for all of us. Yet it was a good move. Their new home is warm and cozy, and I am happy to have them so close. It is an oddity in modern America that my children live literally, if the volume is high enough (and with three small kids, it often is), within shouting distance of all four grandparents. My children, too, loved the house on Timber Lane in their earliest years. But they’ve moved on to new adventures with the youthful oblivion of little kids. They are thrilled to be able to walk to Nana’s and Poppy’s house, and to help transform it gradually into “home.” Along the way they wander down a lane where blackberries ripen in summer, past places perfect for building secret forts, along a path where their own sweet memories will be made. The magic happens each spring. The cold, grey days of winter gradually warm to green. The robins and sparrows and slate juncos return to peck at the ground, their boisterous songs drowning out the happy warbling of the winter chickadees. The peepers sing their chorus from ponds and pools of snowmelt. And we plant seeds. Our house has a large, south-facing window, reaching nearly a third of the way across the long living room, and that is where we start our summer garden. Into little pots of musty soil go the tiny, round seeds of broccoli and the larger seeds of zucchini, butternut squash, cucumbers. Most of the others we plant directly in the ground. But it’s too hard to wait until the end of May to sow the dream of fresh vegetables picked sun-warmed from the backyard garden. Fairytales like Jack and the Beanstalk tell of magic seeds that reap adventure and riches. I don’t expect any of our seedlings to grow to the clouds. Still, there is something enchanting about planting seeds in the spring. There is magic in the promise of the summer bounty that will grow from these tiny seeds, planted when the garden has not yet thrown off the grip of winter. 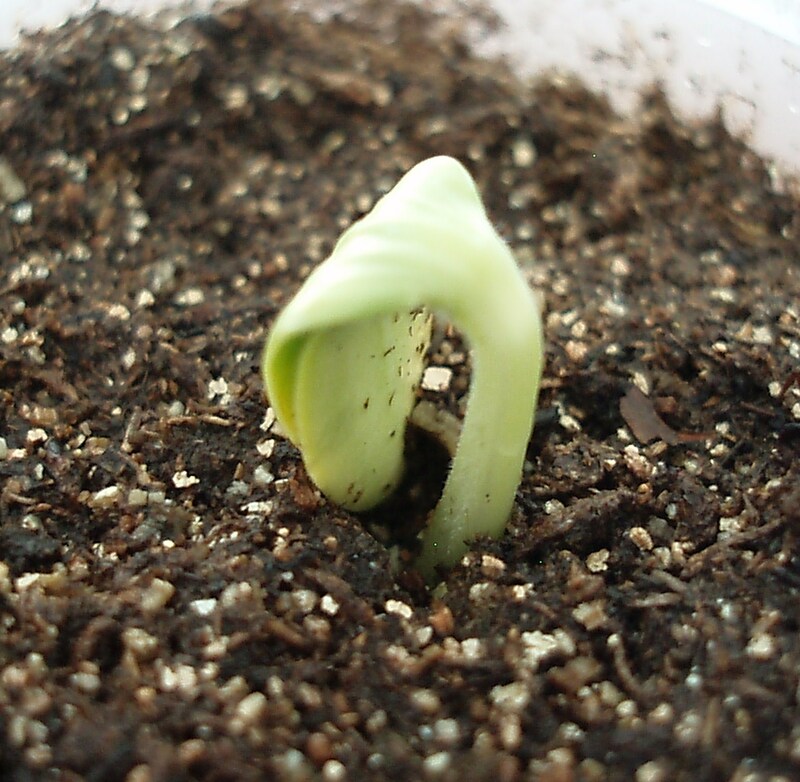 With a bit of dirt and water, sunlight and care, patience and hope, the magic emerges. It has snowed since my young children helped me start the broccoli, their little fingers struggling with the miniscule seeds. Some mornings there is still a heavy frost, and today there is a crisp, white coating of snow on the mountaintops. But the broccoli plants are up a few inches. The squash we planted last week is beginning to pop through the soil, the succulent leaves emerging tiny before they spread and grow, reaching for the sun, reaching for summer.